Built by DAMAC Properties, Suburbia is a spectacular serviced apartment complex comprising two towers with spacious duplexes and single floor apartments. The exterior of the building is inspired by a montage of Moroccan architecture with bright colours and geometrical patterns. The duplexes combine the convenience of an apartment with the feel of a villa, featuring private terraces and beautiful landscaping. DAMAC Suburbia eliminates the need for stressful commuting with its strategic location. Coupled with stellar service standards, it’s an ideal place to live, rent out or host business associates. The apartments are a perfect setting for guests and corporates based in the Free Zone, offering an oasis of comfort for senior executives working in the area. DAMAC Suburbia represents a fantastic opportunity to benefit from Dubai’s flourishing real estate industry. Your apartment is a constant performer – giving you the ultimate in serviced living when you’re in residence and premium returns if you should choose to let it out. Downtown Jebel Ali is becoming one of Dubai’s most desirable places to live and work, with its convenient location and easy connections. Jebel Ali is where Dubai’s major road, seaport, and Metro line converge, and is within easy reach of the UAE’s fast-growing capital city, Abu Dhabi. Nearby, the new Al Maktoum International Airport, set to become the largest in the world, will connect Jebel Ali to all corners of the globe. 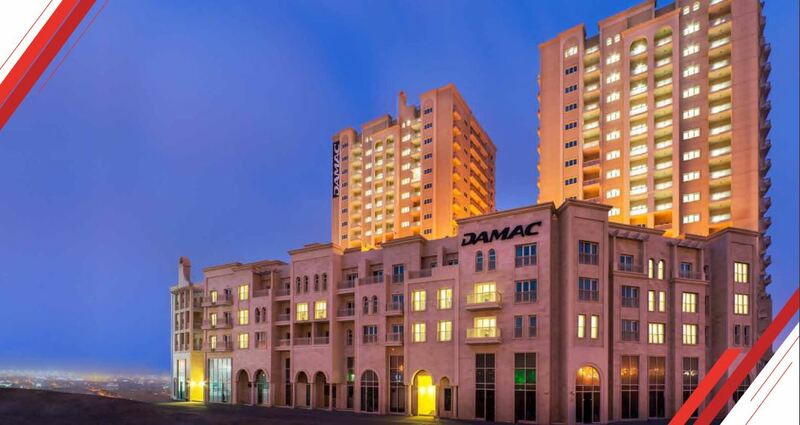 Overlooking Gate 5 of the Jebel Ali Free Zone, DAMAC Suburbia is one of the first premium serviced apartment complexes nestled within a predominantly commercial area. With its convenient location and direct views of Sheikh Zayed Road, DAMAC Suburbia is easily accessible from Dubai and Abu Dhabi. One of the world’s largest themed malls is also close by, and ready for retail therapy at a moment’s notice.